After using the Fujifilm X100S almost daily for seven months, we now take it with us whenever we step out, end of story. If there is even the slightest hint of the possibility of a photo-op, we grab the camera and bring it along. Based on the emails we have been getting about the X100S, we’ve decided to reveal to all those current X100S owners and prospective buyers what is in our grab-n-go gear bag for this camera. We tried two different cases with the X100S camera: a beautifully handcrafted case from JnK Handwork and a no-name half-case for sale on EBay. Surprisingly, we ended up going with the no-name half-case! The JnK case required us to take it off to in order to remove the SD card, whereas the half-case had a cut-out at the bottom for the SD card slot. Folks who use a WiFi SD card will not have this issue, but as we like to transfer the photos to the computer frequently, we found the need to take the JnK case off rather inconvenient. While we loved the look and feel of the handsome JnK, we will always go with function before form when push comes to shove. The one thing we did wish we still had was the protection of a back cover for the LCD. Fortunately, we came across a little gadget for another issue which also happened to address it. The front of the X100S’ body has a bump on the right side to make it easier to grip, but it can still be a little awkward when holding it with just one hand. Our clever interns found a cool little gadget designed specifically to make smaller point-n-shoot cameras easier to hold. It is a little thumb grip that slides into the hot-shoe slot on top of the body. This little lever lets you hold the camera steadily and securely in one hand by giving the thumb something to brace against. 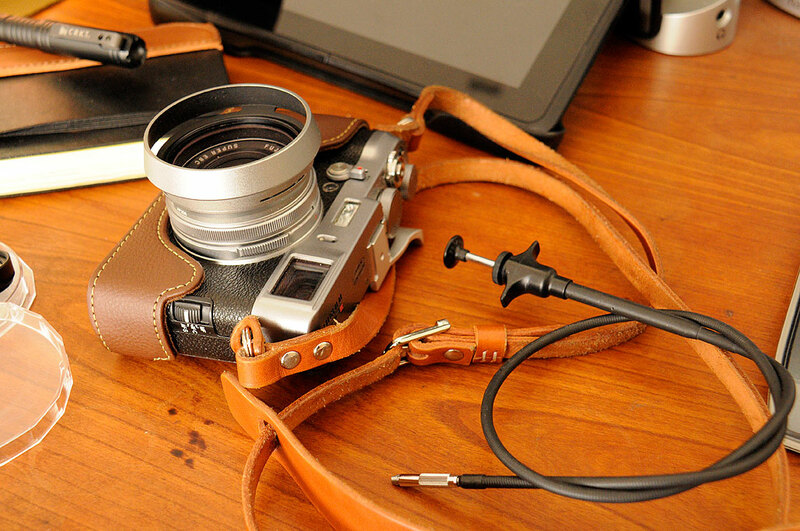 The thumb grip will work with any small camera that has a hot shoe. There are a few versions of this thumb grip out there and they range between $5 and $70 depending on the material used. We recommend getting going with the aluminum instead of plastic. It is just as light but probably won’t break on you. We are not sure if it was intended, but an additional benefit of the grip is that the back of the camera no longer rests flat on a surface, protecting the LCD on the back of the camera from impact! The other bits in our bag are the 49mm circular polarizer (for eliminating glare/reflections, to make the clouds pop, etc), extra batteries / SD card (so we can keep shooting), tools (Leatherman Skeletool, screwdriver), and pen / notebook(analog backup for the smartphone). 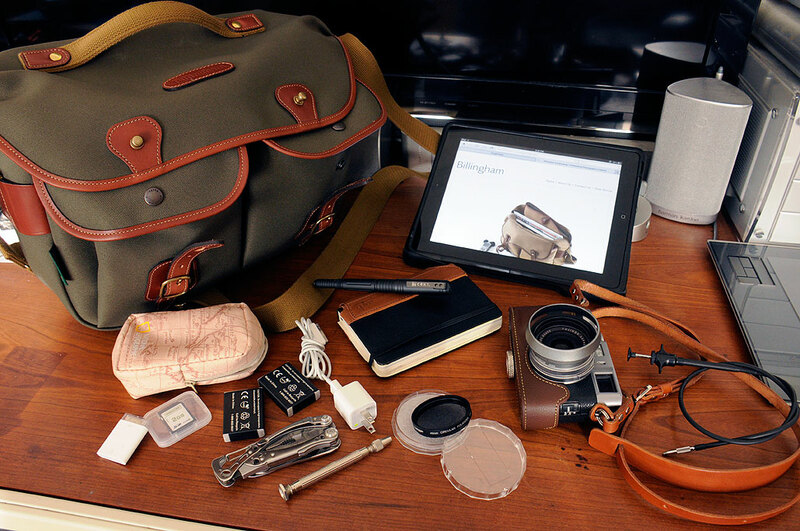 To transport all the gear, we found the Hadley Pro to be the perfect bag. The X100S and the various accessories we take with us on our outings fit comfortably and securely in its various compartments. The bag is even roomy enough to include an iPad, which we use to review and occassionally do some quick editing out in the wild. We would almost say, if you get the camera, just order the bag. The combo is unbeatable in both usability and looks. 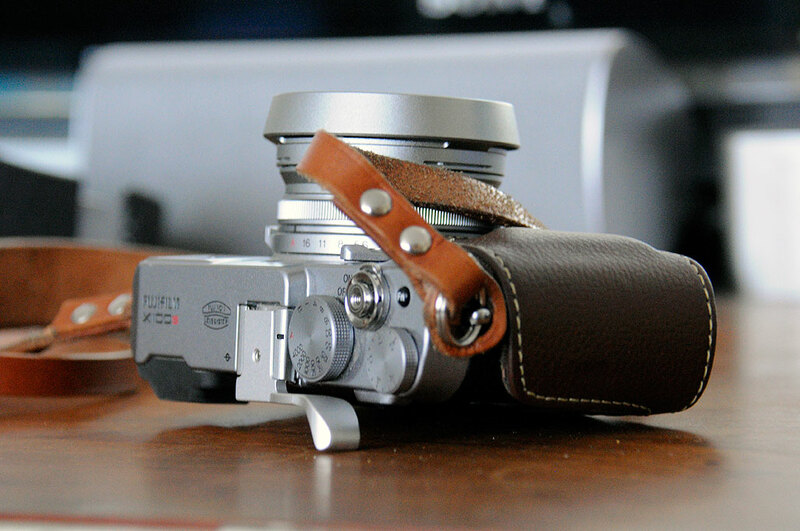 Is the Fujifilm X100S good enough to be our only camera? The answer is “almost.” We do a lot of studio work and the flexibility afforded by interchangeable lenses is undeniable. We also use the DSLR for astrophotography. However, we have used the X100S for both product shots as well as afocal imaging. It is definitely good enough to be our only “grab and go” camera. So…if we ever HAD to choose between the DSLR and the X100S…well, that would be a very thoughtful sit-down. Readers contemplating trading up from a point-n-shoot to a DSLR should give some serious consideration to the X100S. You may find that this little powerhouse will meet almost all of your needs without holding you back.